Common Name: Prepared Soja, or Prepared soybean, Fermented soybean. Properties & Taste: Pungent, sweet, slightly bitter and cold. Functions: 1. To release the exterior; 2. To relieve restlessness. 1. Wind-cold exterior syndrome. Prepared soybean (Douchi) is used with Chinese green onion (Congbai) in the formula Cong Chi Tang. 2. Irritability, restlessness and insomnia following febrile disease. Prepared soybean (Douchi) is used with Capejasmine (Zhizi) in the formula Zhizi Chi Tang. 3. Wind-heat exterior syndrome. 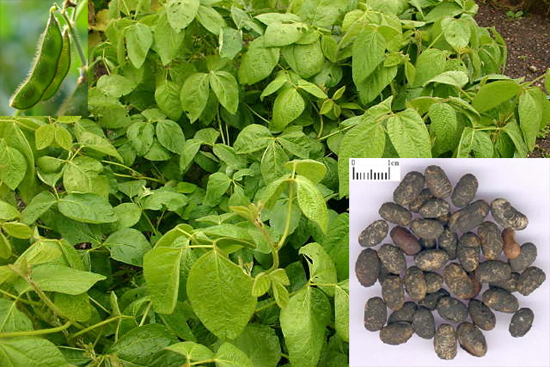 Prepared soybean (Douchi) is used with Arctium fruit (Niubangzi) and Forsythia fruit (Lianqiao). Dosage: 10-15 g, decocted in water for internal use.